In honor of Earth Day, (sorry I’m a day late) here is Michael Crichton's tribute to George Carlin--with video of Carlin's routine "The Planet is Fine". The May 2010 issue of W magazine features an article Michael Crichton: Private View on Crichton and his art collection. It contains quotes from his widow Sherri and from others who knew him. The magazine is currently on newsstands. The auction house Christie’s has created a 17-minute video about Michael Crichton’s art collection. The video, which features interviews with Crichton’s widow Sherri Crichton, agent and friend Michael Ovitz, Printmaker Ken Tyler, and Brett Gorvy, Christie’s Deputy Chairman of Post-War & Contemporary Art, explores his love of art and his passion for collecting. 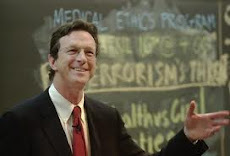 The video contains a clip of Michael Crichton talking about art in a 1976 interview. Christie's will be auctioning off many works from Crichton’s collection on May 11 & 12, 2010 in New York.